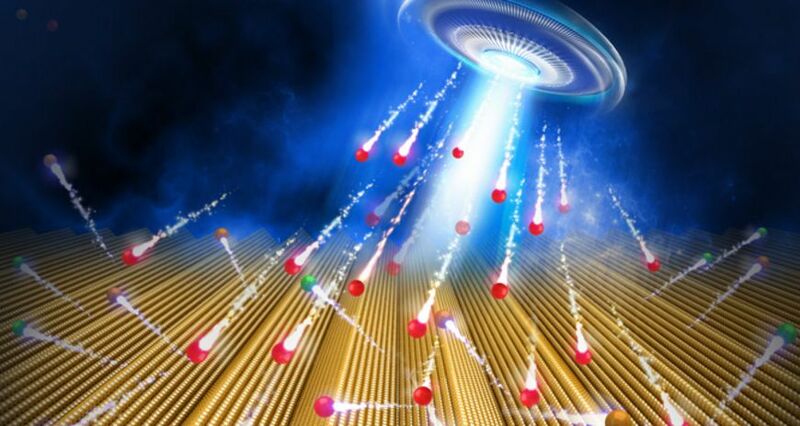 <b>An invasion from space?</b> The ion-source looks similar to a UFO in the graphic representation. With their ion-beam, research scientists are able to produce self-organised nano-structures. It’s like a scene from a science-fiction film: A UFO shoots destructive beams and bores deep craters into the landscape. After the invasion, the world is a different place – it consists of well-ordered, long dunes. In this case science-fiction and science are rather close together. But there was, of course, no UFO available for the research scientists at the Helmholtz-Zentrum Dresden-Rossendorf (HZDR); rather, there was a compact ion-source, from which electronically-charged particles – the ions – bubbled. The research scientists wanted to find out what happens when ions are shot at gallium arsenide – a semi-conductor material from which, for example, light-emitting diodes (LEDs) are made. The ions destroyed the crystal structure of the material at room temperature. In order to avoid this, the researchers heated it up to 400° C. In this manner arsenic atoms were detached and the remaining gallium atoms spontaneously organised themselves into long rows – or figuratively speaking into nano-dunes. All of this took place in the unimaginably narrow range of 30 nanometres, whereby a nanometre is one-millionth of a millimetre. With this experiment the physicists have opened a new chapter in the manufacture of nanostructures. Such surfaces play an important role in the construction of micro-electronic circuits and transistors. “Through spontaneous self-organisation, nano-structures can be produced much quicker than previously,” says HZDR research scientist Stefan Facsko. He already has a concrete application for the new procedure in mind – production of optical grids for ultraviolet light sources. These grids filter out the wave-length range from the light spectrum that researchers need for art-historical investigations of paintings, for example.